Oaklavia returns in 2014. The Office of the Mayor is partnering with Walk Oakland Bike Oakland to bring not one, but two Oaklavia programs to Oakland Streets. In the first-ever cross-municipal Oaklavia event, the City of Emeryville and Oakland's Golden Gate Neighborhood are teaming up to bring Oaklavia to the San Pablo corridor called Love Our Neighborhood Day on Saturday, July 12. 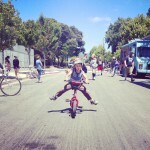 We can't wait for you to play in the streets around Lake Merritt and Downtown. 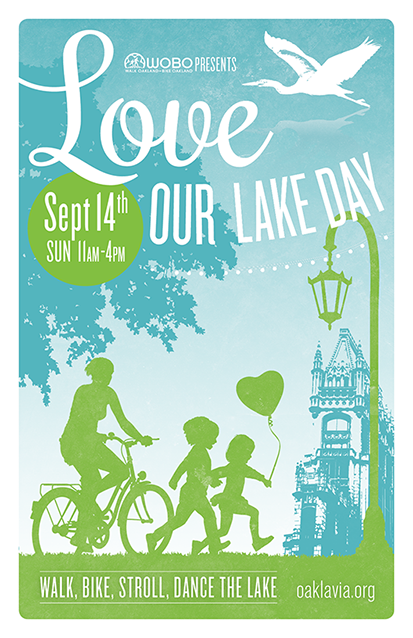 Oaklavia - Love Our Lake Day is scheduled for Sunday, September 14, 2014. You can sign up to host an activity as well as to volunteer in many ways for Love Our Neighborhood Day (June 4) and Sunday Streets Berkeley (October 16). Email us for more information. We are requesting interested individuals or teams to apply to be our Open Streets Director for one or both events in 2016. Complete this Open Streets Director application form prior to March 13, 2016, 5pm. Want to become a title sponsor for an entire block of activities, a sound stage or for the entire series of Open Streets events in 2016? Or explore opportunities also be recognized on print and online recognition as a local business or community supporter? We’re hiring event fundraisers to help secure funding for both events. Join the local planning teams for either events. Host an activity, performance or presentation of music, art, community building, health, fitness, etc., at the event(s).